At BREK Communications, we specialize in helping small- to medium-sized businesses cut costs and become more efficient. We are experts in IP, telephone, and security systems, with more than 25 years of experience providing businesses throughout Southern California with high quality service at competitive rates. We offer a full range of communication and security system services, including design, installation, integration, upgrades, repair, maintenance, training, and support. Our services typically cost about 30% less than those provided by your phone and cable carrier, and as part of our services, we help you streamline processes and control costs. Whether you need to upgrade your communication system, install a new security system, or integrate your communication systems into a single network, BREK Communications offers state-of-the-art, cost-effective solutions. Our experienced technicians provide expert support and perform thorough, accurate repairs on all kinds of communication and security systems. All our repairs are backed by a no-risk, 100% satisfaction guarantee, and we offer technical support services 24 hours a day, 7 days a week, 365 days a year. You can rely on BREK Communications; we have the experience and expertise to meet your business's security and communication needs while staying within your budget. Call us today to schedule a free site survey and estimate in Southern California for any of our services. At BREK Communications, we implement multi-vendor infrastructure solutions that resolve IT challenges facing small- to medium-sized businesses throughout Southern California. By integrating voice and data applications, servers, workstations, and networks into one powerful infrastructure, we can help your Southern California business run more efficiently and save money. 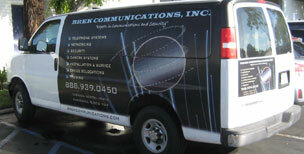 Call BREK Communications today to schedule a free site survey and estimate in Southern California for computer and enterprise network services. All our security systems come with a full range of available features. Call BREK Communications today to find out more, or to schedule a free site survey and estimate in Southern California for security system service. Call BREK Communications today to schedule a free site survey and estimate in Southern California for telephone system service. Call BREK Communications today to schedule your free site survey and estimate in Southern California, and find out what we can do for your business.